Every teacher has had one of those days: your morning classes were difficult, and you’re just counting down the minutes until you can have some alone time during lunch. Lunch arrives, then KNOCK, KNOCK, KNOCK. A student needs some extra support, and there goes your chance to reset before your afternoon classes. 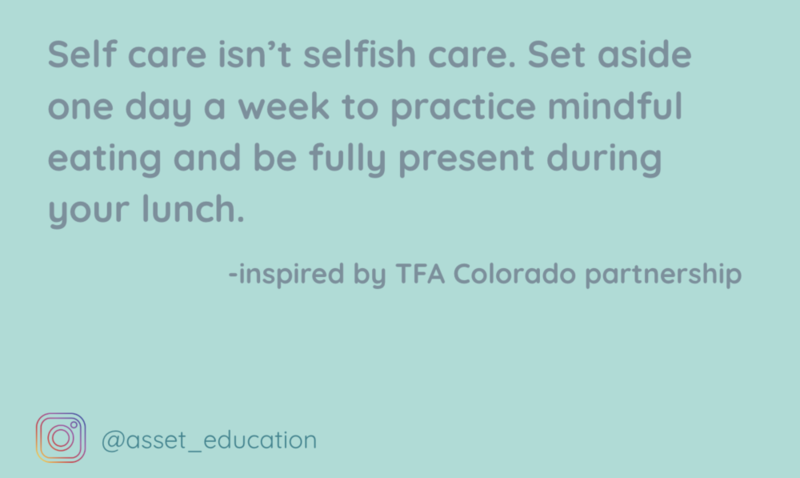 This week’s bite-sized PD centers around the idea that self-care is not selfish. Set aside one peaceful, student-less lunch each week and communicate this to your classes. Modify the Mindful Chocolate by focusing on the sensory experience of eating your own lunch. Hear the crunch of your salad, smell the nuttiness of your coffee, feel a cold apple slice on your fingertips. Psychologists find that such mindful eating practices help you become more grounded and better equipped to tackle the rest of the day.